For those who are not really familiar with the Beneful dog food brand, it is actually a product line of Nestle Purina PetCare. The name “Purina” should already raise some issues about its quality. Surprisingly, however, the brand is actually doing well in the market compared to the other pet food products of its parent company. Could it be that Nestle Purina PetCare has finally found a way to rebuild its reputation as a credible and trustworthy maker of high quality pet food? In this Beneful dog food review we’ll scrutinize every ingredient that the company puts into its formulas and determine whether the Purina Beneful truly deserves a place in your pet’s tummy. This Beneful Original features the goodness of real beef as its principal ingredient, giving your pet the right amounts of animal proteins that it needs for optimum muscle tissue growth and development. It also contains corn gluten meal, soybean meal, and whole grain wheat so pet parents who are wary about causing gluten allergies in their pets will be duly informed. This Purina Beneful dry dog food capitalizes on the use of farm-raised cattle as the primary source of the proteins that it puts into each kibble. This provides a good source of essential amino acids that your pet will surely benefit from. Antioxidants from fruits, grains, and vegetables included in the blend provide additional health benefits for your growing pet. 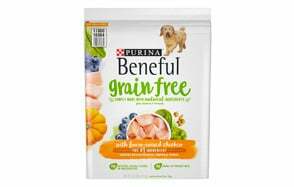 Pet parents who are worried that their pets may have gluten allergy can rest assured that this grain free formulation of Purina Beneful dog food is just right for the job. It doesn’t contain any of the grains that are considered as the culprit for gluten allergy reactions in dogs like wheat and corn. What your dog will be feasting on is the awesome taste of farm-raised chicken which should provide a totally different dining experience for your pet. The addition of cassava root flour and pea starch gives your pet the energy that it needs, although increasing the proportion of animal proteins should readily address the energy requirements of any dog. Nevertheless, this Beneful dog food is still a wise choice for those looking for a grain-free formula. Giving the IncrediBites Beneful wet dog food variety pack is like giving your pet 3 different sumptuous meals that it can devour in one go or divided as topper for its favorite kibble. The variety pack comes in Beef, Chicken, and Salmon variants, each blended with tomatoes, carrots, and wild rice. The Real Salmon variant is like giving your pet a taste of the bounties of the Pacific Northwest while either Chicken or Beef variants should keep your pet’s palate really interested in the amazing taste that it gets. Each can of this Purina Beneful product is guaranteed to deliver the right amounts of nutrients necessary for optimum development of dogs. Your dog will love the meaty, bite-sized chunks of meat and veggies that are slathered in an extra-thick, yummy sauce. 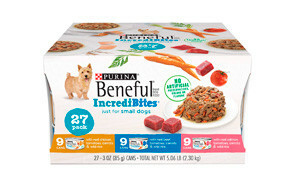 The Purina Beneful IncrediBites dry dog food variant provides all the essential amino acids that dogs need, thanks to the use of farm-raised cattle as the source of its animal protein. Corn, wheat, rice, and barley are added to provide the energy that physically active dogs need. It also has the right amounts of vitamins and minerals for supporting a variety of physiologic processes including healthier digestion, nervous integration, cardiovascular functioning, and immunologic readiness. This is one dog food you would definitely want to give to your pet especially if it is the hyperactive type. The taste of beef plus peas and carrots should really pump up your pet’s appetite so it will get all of the nutrients that this IncrediBites provide. 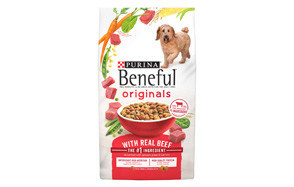 The Prepared Meals line of Purina Beneful Dog Food can be considered as the brand’s own take on home-cooked food that is especially formulated by professionals for all dogs. There are 3 flavors in this Beneful wet dog food variety pack: Beef Stew, Chicken Stew, and Rice & Lamb Stew. It’s like giving your beloved pet three main courses, each with its own distinct taste and is characterized by the use of chunky, meaty bite-sized pieces that will surely have your dog gobble up its meal in no time. Add to this the savory gravy that can serve as moistening agent for your pet’s kibble and you know that the tasty meal is just half the story. The other half will be the completeness of the nutrients that your pet will get with every bite and slurp of its Purina Beneful Prepared Meals diet. Beneful is a product line under Nestle Purina PetCare based in St. Louis, Missouri. Beneful is produced alongside other notable product lines of the company like Pro Plan, Dog Chow, Friskies, and ONE. The brand is the largest pet food company in the US and is the second worldwide. As a brand, Beneful is relatively new having been introduced in 2001. The product line was conceptualized to appeal to pet parents who are looking for a different kind of dog food than what they are already accustomed to. The first product resembled stew and actually contained real beef pieces. The product line was embroiled in a class-action lawsuit in 2015. The complaint cited the presence of toxic ingredients, particularly mycotoxins, in a number of Beneful dog food products. Purina countered by saying that the ingredients are all duly-approved by the FDA. In March 2016, the company voluntarily recalled affected lots of its Pro Plan and Beneful product lines because of insufficient amounts of minerals and vitamins. Why Choose Beneful Dog Food? If you don’t mind feeding your pet wheat, corn, and soy or any of the ingredients many pet parents are quite wary of, then Beneful should be a great choice. Its use of farm-raised animals is always a welcome development from a company that is generally known for putting more fillers into their formulas rather than real meats. Pet parents who want a reduced-fat alternative to their current dog food, the wet dog food formula of Beneful is a great choice since it has one of the lowest dry matter fat content one can get from the market. However, just don’t go asking about the levels of EPA or DHA from these products as there are none. Individuals who would like to give their pets moderate amounts of calories and proteins just enough to meet their daily metabolic requirements can rest assured that Beneful will deliver such requirements to them. The calorie content of Beneful dog food is one of the lowest among the countless dog food brands. This should be perfect for dogs that are prone to obesity, diabetes, and cardiovascular problems. The true measure of a dog food brand’s effectiveness as a provider of high quality dog food can be measured through the ingredients it uses. In this Beneful dog food review we’re going to carefully analyze the ingredient mix of the brand as far as the 5 products that we’ve featured are concerned. Based on the 3 dry dog food variants and the 2 variety packs of Beneful wet dog food in this review, we determined the protein content for the dry dog food was 24.67% while the wet variety had 10.33%. When the moisture content of the said products was taken into consideration, we came up with the following dry matter percentage of protein: 28.35% for dry dog food and 44.9% for the wet food variant. While it is easy to say that 45% is high, it should be noted that other brands of wet dog food can have a protein content of as much as 55% for the wet version. For the dry version, most high-end, high-quality protein-rich dog foods come with at least 35% of dry matter equivalent. This puts the Beneful dog food brand well behind these protein-rich dog food products. We noted that the first ingredient for the brand’s wet food product is actually water and not an animal protein. This is very different from other brands whereby the animal protein always comes first. Moisture is always secondary and is often in the form of the broth from the cooked animal protein, not plain water. One wet food variant even placed its animal protein as the 6th ingredient, putting more emphasis on wheat gluten, meat byproducts, white rice, and liver. Another point we’d like to raise is that there are many questionable animal products in the ingredient list. We’ve noted the use of the term “meat byproducts” or “liver”. We’re not sure what animal they took the byproducts or the liver from. This runs against every rule that veterinary nutritionists espouse when listing ingredients. The ingredients should always be clearly identified. The good news is that Purina Beneful uses farm-raised animals in their formulations. We just don’t get it why they don’t want to just write ‘chicken liver’ or ‘beef liver’ if that is where they sourced the liver from. As far as the fat content is concerned, Nestle Purina’s Beneful brand comes with rather pleasing results. Its dry variants have an estimated dry matter fat content of 14.7% which is still a bit lower than other brands nearing the 20s. Its wet variant, however, is what is really surprising since it is only about a few percentage points from the minimum recommended fat intake for dogs by AAFCO. We computed the wet varieties of Beneful dog food to have a dry matter fat content of only 9.78%. Not everything is good news, however. We couldn’t find any information about DHA and EPA in the products that we’ve reviewed. We did manage to note the presence of linoleic acid in a few products, but this is basically an omega-6 fatty acid. We’re more concerned about the omega-3s especially when it comes to immune, nervous, cardiovascular, and integumentary system health. While both NRC and AAFCO doesn’t provide guidelines about the correct proportion of carbs in dog food, we can only make an estimated guess based on the prevailing convention that the dog’s diet should consists primarily of proteins. When the protein and fat contents were computed in both the dry and wet versions of Beneful we arrived at the following results: 56.95% carbohydrates for the dry and 45.32% for the wet. We’ve seen dog food products that fare way better with the dry dog food formulation containing no more than 40% carbs while the wet food variety is in the lower 30s. The implication is that, while Beneful promises to utilize premium animal ingredients in its formulas, it is nowhere near the expected proportion of animal proteins. One can safely say that Beneful retains the characteristic of its parent company – using more carbohydrates as fillers instead of using more premium quality animal ingredients. This is where most of the corn and wheat that is present in many formulations come in. Beneful meets NRC and AAFCO recommendations for micronutrients, although we’d like to point out that we sorely miss the probiotics, chondroitin, and glucosamine in other brands. While these are not recognized by AAFCO and NRC as essential nutrients, they can help in promoting healthier digestion, immunity, and joints. One of the products in this review mentioned “artificial and natural flavors” as well as “added color”. We are not absolutely certain just what kind of “artificial” flavoring was used or what variant of “added color” was used in the formulation. Suffice it to say that these ‘ingredients’ are even listed underscores the brand’s continuing disregard for pet food product safety conventions. Nestle Purina PetCare’s Beneful dog food product line promises to deliver higher-quality animal proteins as its first ingredient. Sadly, there were instances when the first ingredient was not even an animal protein at all. Worse, there are also unnamed animal ingredients in the mix as well as artificial ingredients. Beneful may have a friendlier, more posh packaging, but it is nothing more than a plant-based dog food diet that contains below average to moderate amounts of animal proteins and more carbohydrate fillers.